Early in 2003 Dutch Top Methanol Funny Car racer Lex Joon announced that he was to move to Fuel Funny Car with major backing from MPM International Oil Company. Lex acquired the ex-Skuza Showtime spare from Bob Jarrett and planned to contest the 2003 British Nitro FC Championship starting with the FIA Main Event as well as making exhibition passes at events at Drachten, which are promoted by Lex and Team Manager Gerda Dijkstra. 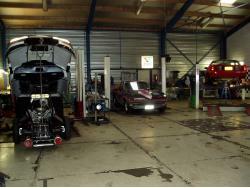 Lex also finds time to run Lex Joon Autobedrijf, a successful American car sales and service centre in Zaandam. We visited Lex and Gerda at Lex's workshop in Zaandam just before the 2003 FIA Main Event to get the low-down on the move to Fuel FC. Eurodragster: You've been racing for a long time now. How did you start? Lex Joon: I started racing in 1984 with a street car. At that time in Holland, drag racing was heads-up no breakout, you just had to be the fastest. I bought a Camaro and put in a V8. Then I built a tube chassis for it and became European Pro Street Champion racing all over Europe. I bought my first Funny Car which didn't have a blower, it was just injected on alcohol. After I sold that I bought a complete running Top Alcohol Funny Car from Bernie Hepworth. The car just went quicker and quicker. There is so much to learn, you have to look all around the motor and other systems to see what's going on. My next car was the Probe, then we put the Camaro body on and changed a few things round. Eurodragster: It seems to me that you have a particular love of Funny Cars. Lex Joon: I have always felt good in a Funny Car, on my first run I was so comfortable and it went so well that everyone thought that I had done it before. That's because the moment I saw a Funny Car I knew that that's what I wanted to do! Dragsters never appealed to me. If someone gave me the money I would do it but if I had the choice I would always choose the Funny Car. Eurodragster: How did you win MPM International Oil Company as your primary sponsor? 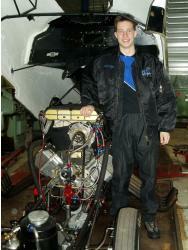 Lex Joon: Michiel van Wilgen of MPM Oil helped the Dutch Hot Rod Association with street-legal events at Drachten. We heard that he wanted to get involved in racing, so we contacted him to speak about helping to promote our events at Drachten. MPM are now title sponsors of the race at Drachten in July, and the Funny Car deal came from those talks. MPM are not that interested in backing dragsters. A lot of oil companies are involved in drag racing in the USA - look at John Force, well now Michiel has got his own John Force! Eurodragster: It seems more difficult to get sponsors in some countries than in others. How do you fare in Holland? Lex Joon: It's difficult to get sponsors. We're also promoting the races at Drachten, and MPM went with us because we both promote and race. Gerda works every day on this and we hope that it pays off at the end of the day. Holland really needs a permanent track and one day we hope that we'll get there. Gerda Dijkstra: Some days it is really hard work. We have the workshop here, the race team and the promotion. Eurodragster: Did you look to the USA for a Fuel Funny Car, or did you go straight to Bob Jarrett? Lex Joon: You never see advertisements for Fuel Funny Cars in National Dragster so I have no idea how much they cost. You can't buy a complete running Fuel FC and in any case you could not just buy one from the USA and expect it to work in Europe. You could buy the parts and build one here but you won't know what to do, you will still need someone who knows a baseline. The option of the Showtime car came up and it wasn't a difficult decision to make - which is the best Fuel FC team in Europe? Bob has run that car so he knows it. Eurodragster: Are you doing everything this weekend or have you already started familiarising yourself with the car? Lex Joon: I have already had my seat fitting. It's a very nice car, with a lot of attention to detail. It's made very few runs and everything is certified. We went to Santa Pod and Shakespeare County Raceway to see how it all works. We had to leave the Excitement Nationals before the final, but Bob was on his mobile to tell us that John had won almost before he was out of the car at the end of the track! As far as the car is concerned we might make a few changes but nothing this year. Jörgen Al has designed the body and it's going to look very different! We also have crew uniforms in MPM colours including some new jackets which were finished today and team shirts which are being made by Ian Turburville. Eurodragster: What do your crew think about changing to Nitro? Lex Joon: We have been talking about it for a year. We were planning to do this last year, but things happened. The guys are really enthusiastic and excited. 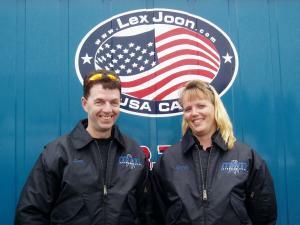 Gerda Dijkstra: Lex's fourteen-year-old son Martijn has an active role in the crew for the first time this weekend. He has his own duties on the team and he realises how serious and responsible you have to be. He is nervous and excited at the same time and he loves his crew jacket! Eurodragster: Who is going to make the tuning calls? Lex Joon: To begin with, Bob will be helping us out and I will talk over set-ups with him, and we will slowly take over. We have a certain amount of knowledge already and I will be standing by Bob asking "Why" a lot! As things go on, we will work things out for ourselves but we need to get from A to B and get acquainted with the car first. This car should go 5.2, but if you run 5.4 or 5.5 - which it can do as it is - you should make the final. I want to go quicker than I did in the TMFC or it's not worth it. The difficult bit will be when you start to select parts for yourself. I remember when you interviewed Randy Anderson a few years ago, he said that Top Methanol and Fuel Funny Cars are different. But there are some common factors. I am looking forward to tuning the car, it will be interesting to see what you can achieve. If you use common sense then you will run the numbers. You can have all the money in the world but if you make the wrong call then that's it. Gerda Dijkstra: The good thing about this deal is that in Bob we have someone who knows what they're doing. Eurodragster: And you can never have too many Fuel Funny Cars! Lex Joon: Yes, it is good to have more cars performing. When you talk to Bob, he likes the idea that the Showtime team will have to step up, because we will give them a reason to do it. It's good for the fans too: they are sitting in the stands rain or shine, and you mustn't forget that they are helping to fund your prize money. You want as big a crowd as possible, so you have a duty to make them want to see you. Eurodragster: Is the car coming back with you after the Main Event? Gerda Dijkstra: And it's going to get crowded in the shop because our Methanol car is still here! Lex Joon: ...it will be on show at the first of our races at Drachten and then we will make an exhibition run at the MPM Oil Nationals in July. Eurodragster: I think I speak for everyone when I wish you the very best of luck this weekend and that I hope that it is the start of a long and successful Fuel career. Lex Joon: Thank you very much! I would like to say a big Thank You to Bob Jarrett and John Spuffard for all of their help so far, and to all of the fans who have wished us luck. And of course the biggest Thank You goes to our sponsors MPM International Oil Company and Stena Line. Eurodragster: Thank you very much indeed for your time and your hospitality. See you at Santa Pod in a few days!